Dwayne Johnson Isn't Sure He'll Be in the Next Fast & Furious. Happy, Tyrese? For months, Tyrese has screamed into the ether about why Dwayne “The Rock” Johnson is singlehandedly ruining the Fast & Furious franchise. The universe seems to have heard Tyrese’s cries, at least in part, because Johnson says he is “not quite sure” he’ll participate in the ninth installment. What hath Tyrese wrought? This news should make Tyrese happy, because he, at least, may not have to work with his unofficial stepbrother in the main F&F film, and thus The Rock won’t destroy the team with his poison. But it doesn’t change the fact that the spinoff is happening. As Tyrese previously explained at unnecessary length, in a series of rants on Instagram and in videos, Johnson’s spinoff has already created a rift in the Fast & Furious framily by causing its release date to be pushed back. “Everybody coming at me like I’m hating on Dwayne about his spin-off. I’m not.” Tyrese said while lounging in a limo. “The truth is, I just wish he was releasing it at a different time.” We all have dreams, Tyrese. 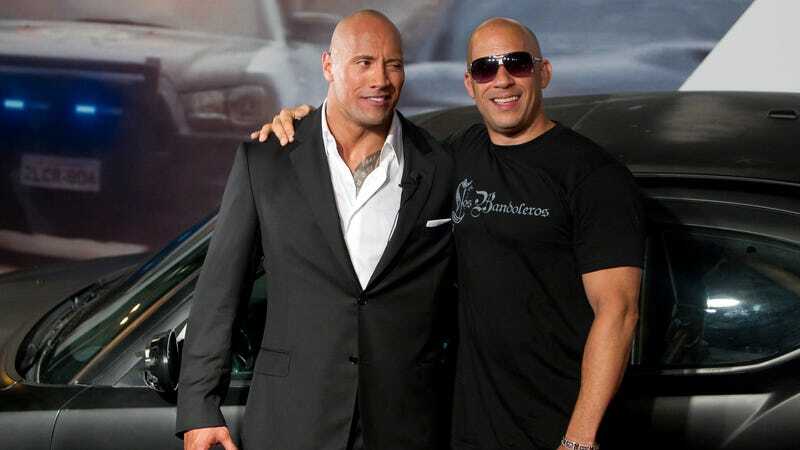 Can You Guess Which &apos;Candyasses&apos; Have Infuriated the Rock on the Set of Fast 8?